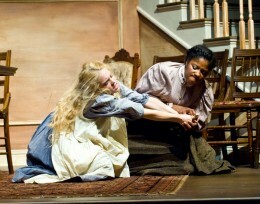 Wright State University will open its 2012–13 theatre season with "The Miracle Worker." 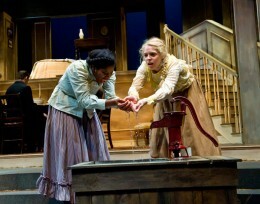 Wright State University will open its 2012–13 theatre season with the Tony Award–winning play The Miracle Worker. Anchoring the show are the two young women in dynamic lead roles. Sophomore musical theatre major Kate Mueller portrays Helen Keller, a young girl who is both deaf and blind. Senior acting major Cyndii Johnson plays Anne Sullivan, the dedicated teacher who connects Keller to the outside world. The production is helmed by theatre faculty member Lee Merrill. Audiences may remember her as Linda Loman in last season’s Death of a Salesman. The show tells the true story of Helen Keller and her teacher Anne Sullivan. The Miracle Worker is a three-act play by William Gibson. It originally opened on Broadway in 1959 and starred Patty Duke as Keller and Anne Bancroft as Sullivan. That production won four Tony Awards, including Best Play and Best Actress for Bancroft. The play was adapted into a 1962 film in which Bancroft and Duke reprised their Broadway roles; both actresses received Academy Awards for their performances. “Helen Keller became one of the most important people of her generation,” said McDowell. The original 1959 Broadway production of "The Miracle Worker" won four Tony Awards , including Best Play and Best Actress. The Miracle Worker runs Sept. 20 through 30 in the Festival Playhouse of the Creative Arts Center on Wright State’s Dayton campus. The rest of this year’s mainstage lineup includes the classic musical Funny Girl (Oct. 25–Nov. 30); the return of the Wright State original 1913: The Great Dayton Flood (Jan. 24–Feb. 10); and the rarely performed, five-time Tony Award–winning musical Grand Hotel (March 14–31). Audiences can also enjoy Spring Awakening (Nov. 9–18) and All in the Timing (Feb. 15–17) in the “blackbox” Herbst Theatre. Tickets for mainstage productions, including The Miracle Worker, are $20 for adults and $18 for students/seniors. They can be purchased by calling the Theatre Box Office at (937) 775-2500. The production is directed by theatre faculty member Lee Merrill. “The Miracle Worker” is a three-act play by William Gibson. The original 1959 Broadway production of “The Miracle Worker” won four Tony Awards , including Best Play and Best Actress. Wright State’s production star Kate Mueller as Keller and Cyndii Johnson as Sullivan.